Leading up to our petition delivery last week, we ran a day-of-action with our friends and allies from around New Zealand, which was instrumental in getting publicity and tons more signatures on our petition – thank you if you were part of this day! Not only did we make it on to Seven Sharp, but we hit nation-wide news and got tons of stories in local papers too. Starting with Dunedin – local organisers from Keep Dunedin Beautiful had a lot of fun with a pop-up-bottle drive at the Octagon, demonstrating how a refund system would work here in Aotearoa – people cashing in bottles and cans for 10c refunds. Organisers Fiona and Laura ran it celebratory-style with a Takio (Japanese traditional drumming) group playing beats and school kids participating too. Here’s an article about it in the Otago Daily Times. 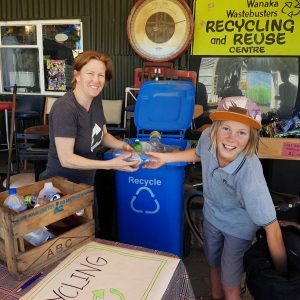 Wastebuster’s in Wanaka hosted a bottle drive in their shop, giving out 10c refunds to local bringing in bottles and cans. 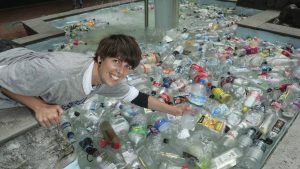 Organiser Gina Dempster told the Otago Daily Times many locals supported revamping bottle deposits here – “lots of people remember when we used to earn 10c for recycling a drink bottle or a can, and don’t know why we ever got rid of it”. If New Zealand got bottle refunds, places like Wastebusters would be great locations for depositories – where people take their ‘empties’. Gina told The Wanaka Sun the key to making a recycling refund scheme work is to have a variety of depots and container drop-off locations for bottles and cans, of which Wastebusters could become one – and earn container-handling fees for doing so, which would boost funding for the centre. Up in Ōtautahi (Christchurch) our campaigner Rowan Brooks organised a pop-up bottle drive in Federal Square with local supporters. The team placed a load of plastic bottles they’d collected beforehand in the middle of the square and offered out cash refunds to whoever brought this “litter” to their bin for recycling. People soon got the idea and enjoyed getting involved. Here’s a video of a fan remembering his childhood bottle refund ‘golden years’. First port of call in the North Island, Pōneke (Wellington) lived up to its wild and windy reputation and was so stormy on Tuesday the 27th (the day-of-action) that we had to delay our event ‘till the Thursday that week. It was well worth the wait, though, and on Thursday morning a bunch of volunteers and our campaign coordinator Holly went down to the city centre where they put 400 plastic bottle (borrowed from a nearby recycling centre) into Wellington’s iconic Cuba Street bucket fountain. This drew a few looks from passers-by who were encouraged by volunteers to pluck a bottle or two (or ten) out of the fountain and bring up to the pop-up bottle refund stall, conveniently placed right next to the fountain, for a cash refund. School groups came to visit the team, excited to get some pocket money for bottles. Piece by piece, the bottles were cleaned up and brought back to the stall for cash-refunds, where passers-by got to sign the petition as well. We got some great coverage from the Dominion Post and Radio NZ, and had fun wading through the fountain to clean up leftover bottles at the end of the day. 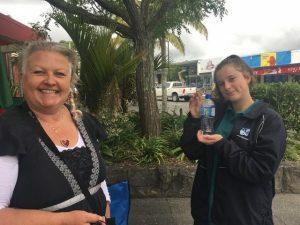 Whanganui gave out cash-refunds for bottles from their shop at the Whanganui Resources Recovery Centre and gathered hundreds of signatures for the petition. 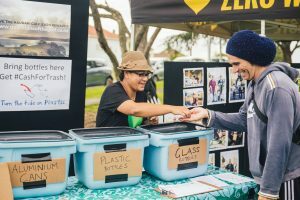 Whaingaroa (Raglan) rolled their event out over a couple of days, getting people to bring in bottles for cash-refunds to the Environment Centre and signing people on to our petition. 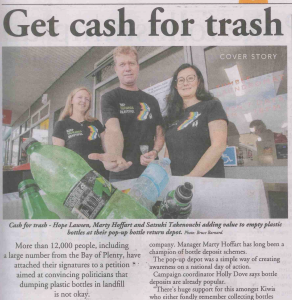 In the Bay of Plenty, Tauranga locals made the front page of the local paper The Sun, with a pop-up bottle drive, giving out cash for bottles, run by volunteers from Keep Tauranga Beautiful and the folks at Waste Watchers. 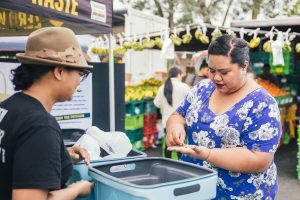 Our friends from EcoMatters in Tāmaki Makaurau were down at the Westley Market in Sandringham, running a pop-up bottle drive and collecting signatures on the petition. Not only did they take some amazing pics themselves, but they also featured on Seven Sharp that evening! Local organiser Ina Patisolo says the idea was to demonstrate how a bottle refund scheme would work and to drum up support for our petition, heading to Parliament the following week, calling for the introduction of a nationwide scheme bottle deposit scheme. “Kiwis are behind this initiative – we had lots of people coming to bring us plastic bottles and cans and sign the petition; we’re all sick of seeing plastic littering streets and beaches and this is something we can do about it,” she says. Up in Northland were two small teams of dedicated volunteers, out on the streets of Kaikohe, Kaitaia and Kerikeri. Local organiser Barbara Belger, of Plastic-Free Kerikeri said a bottle deposit scheme was key to changing how people thought about waste.